The customary ‘Dear Santa’ letters, written by children every December 24th on Christmas Eve, is a time honored tradition. I encountered 3 such letters, from Mont and Ellie Thackara’s children, when I started transcription work for the Digital Library. The ‘wish lists’ penned to Santa by Eleanor, Sherman and Alexander (“Lex) Thackara reflect each child’s deepest longings and are shared by today’s children whether one has been ‘naughty or nice.’ Such things as “a pair of skates and a little iron and iron holder” requested by Eleanor. Sherman wanted Santa to “bring me a sled.” Lex was ‘all boy” when he wrote, “Please bring me a rifle a pen-knife and a kodact.” My guess for Lex’s wish was for a Kodak camera available since 1888. Sherman notes his behavior as a good reason for his filled stocking. While working on these letters, I marveled over the simplicity of the times and experienced a child’s excitement in the penned letter to Santa on Christmas Eve. I enjoyed transcribing these pieces and many other of the Thackara correspondence. With over a thousand pieces in need of transcription the Sherman-Thackara Collection in the Digital Library has reassured me there many more items to still transcribe. Here is a link to the Finding Aid for this part of the Sherman-Thackara Collection. 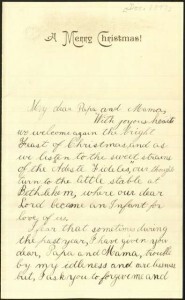 Letter, To: “Dear Papa and Mama” (Ellie and A. M. Thackara) From: “Lex” (A. M. Thackara, Jr.), Christmas 1893. Letter, To: “My dear Father” (A. M. Thackara) From: “Eleanor” (Eleanor Thackara Cauldwell), Christmas 1893. Letter, To: “Santa Claus” From: “Eleanor” (Eleanor Thackara Cauldwell), [December, 1895?]. Letter, To: “Santy” From: “Your loving friend Lex” (A. M. Thackara, Jr.), December, [1886?]. Letter, To: “St. Nick” From: “Sherman” (William T. Sherman Thackara), December 20, 1896. Fascinating post. Thanks a lot.